The work of Cécile Massart is focused on researching new means of conveying the memory of radioactive waste sites in the landscape. ©Richard Stephens/Special to PVT - Belgian artist Cecile Massart sits among the ruins of the Bullfrog jail behind the Red Barn Art Center at Rhyolite. Cécile Massart is a visual artist who practices engraving, photography, computer graphics, video, sculpture and installations, and creates artist’s books. Between 1977 and 2005 she taught engraving at the Academy of Ixelles and conducted ten years of extensive research in the field of engraving. Subsequently, she taught at the ESA Mons and the ENSAV La Cambre in Brussels. 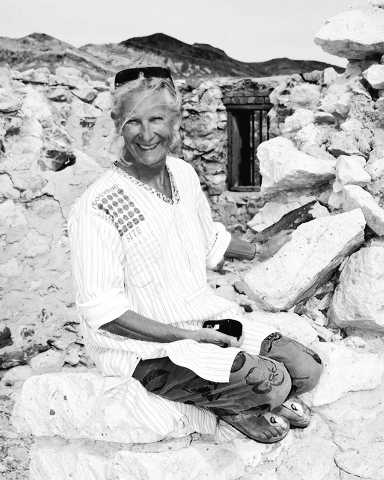 She is also co-founder of the Art school of Loulé in Portugal. From 1984 until 1992 she developed a passion for the pixel and produced two series of works under the titles Graph and Pixel Story. In 1994, she raised the issue of concealed storage sites of radioactive waste in Europe and worldwide. The resulting artworks appeared under the title “Un site archivé pour alpha, bêta, gamma”. Today, through her artistic work, she intends to educate the public and the relevant authorities about the necessity to clearly identify such sites. For this purpose, the artist is developing specific markers that give current and future generations a strong signal for hundreds of years. The work of Cécile Massart is focused on researching a new means of conveying the memory of radioactive waste sites in the landscape. She has developed an architectural vocabulary to identify the slow level disposal waste site : the markers or archi-sculptures. In 2009 the artist designed a series of markers and the book ‘COVER’ was issued. Her objective is to inscribe this unique 21st century archeological stratum in the landscape thereby calling for the responsibility of everyone. What kind of energy policy do we want for the future? What heritage do we want to pass on? When it comes to high-level waste the artist opens up new fields of investigation with the Laboratories, a series of 7 drawings she has done in 2014. These seven places, more accurately designed as conceptual proposals, are located within the perimeter of the storage site. They contribute to the design of markers in the landscape and their update in order to pass on the memory. Through experimentations, new ideas come to light for the safety of the living world. It brings together scientists, philosophers, neighbors and researchers/guardians among others and it is passed on to future generations. 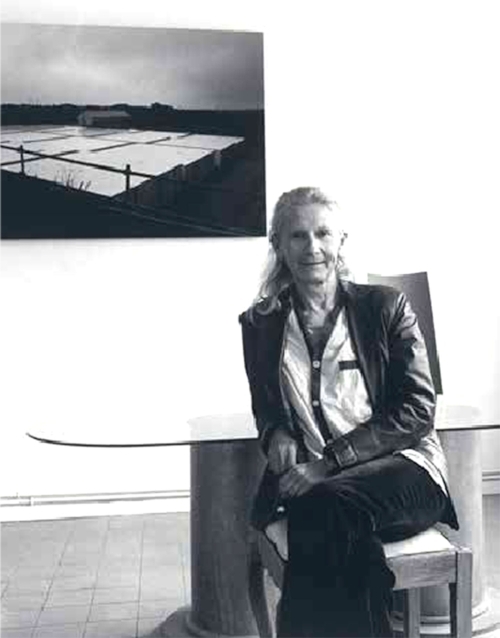 Cécile Massart has works in numerous private and public collections.